Over the years, many gravestones in this 1796 cemetery have tipped or fallen over due to frost heaves and gravity. Some of the stones are of the town’s poor, including slaves. Come help honor their memory by straightening the stones. Bring shovels, pry bars, and tampers. Learn some interesting stories about this cemetery that was located in a village loyal to the King during the Revolutionary War. Call 860-921-6118 or email us at plymouthct.historical@gmail.com if you’d like to help. The tour starts at the Terryville Public Library, 238 Main Street. 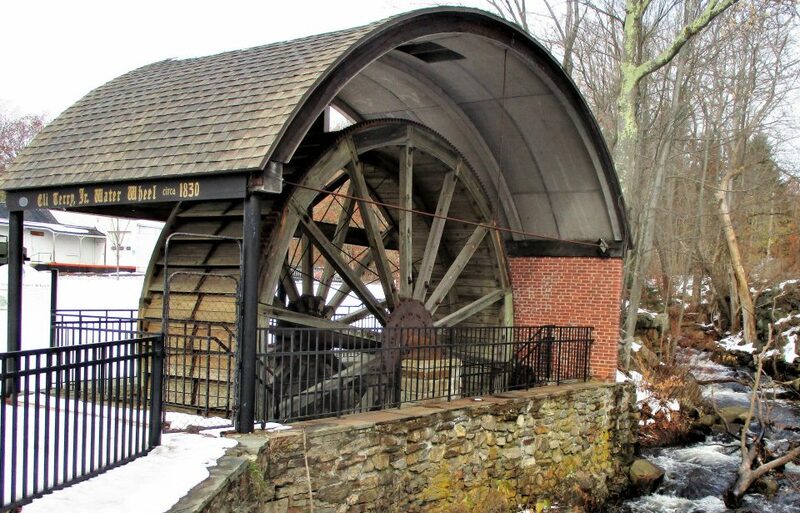 It will include stops at the Water Wheel, the Lock Museum of America, the Terryville Congregational Church, the Old Terryville Cemetery, and the Dorence Atwater Monument at Baldwin Park. The tour will last about 90 minutes. The tour is free but registration is required by calling the Library at 860-582-3121. New Discoveries from the Attic of the Plymouth Historical Society! Call the Library at 860-582-3121 to register for this interesting presentation. Historical Society celebrates its 50th anniversary in 2019! We are already planning some new exhibits in the Museum, including some items that were recently donated. Stay tuned for more information as the year progresses. 2020 is the 225th anniversary of the Town of Plymouth! In 2019, the Historical Society and the Beautification Committee are getting a head start in celebrating Plymouth’s 225th anniversary by painting a mural on the wall of the Lee Hardware building on Main Street. Thomaston Savings Bank has generously provided a grant to pay for paint and supplies. Our first organizational meeting is Wednesday, March 13 at 7pm in the Mayor’s Conference Room at the Town Hall. Self-guided walking tours of Plymouth Center are always available at your convenience! Click on the link below and print a copy of the Guide. Brochures are also in the box behind the sign at the entrance to the Burying Ground (next to the Congregational Church on the Plymouth Green, corner of Route 6 and North Street). The Plymouth Burying Ground dates to 1747. There are 38 soldiers from the Revolutionary War buried here. Learn about the symbolism of colonial gravestones. Look for some ancestors! Find the stone that is inscribed “MORTALS ATTEND and LEARN YOUR END”. Creepy! Guided walking tours of Plymouth Center can be arranged for your group. The tour includes the Burying Ground, listed on the National Register of Historic Places. The inscriptions and symbols on the gravestones provide a timeline of early American history, giving us clues to what life was like in colonial Connecticut. Learn about the French and Indian War, the Revolutionary War, and the little known story of the Tories, the American colonists who were loyal to their mother country of England. Seniors, youth groups, school classes, home schoolers, and historical organizations have enjoyed our tours. The tour is a wonderful supplement to Connecticut’s 5th grade social studies curriculum which covers colonial America and the Revolutionary War. There is a $10 suggested donation for adults, kids are $5. Minimum total is $50. All funds are used to restore the Burying Ground. Call 860-921-6118 for more information.